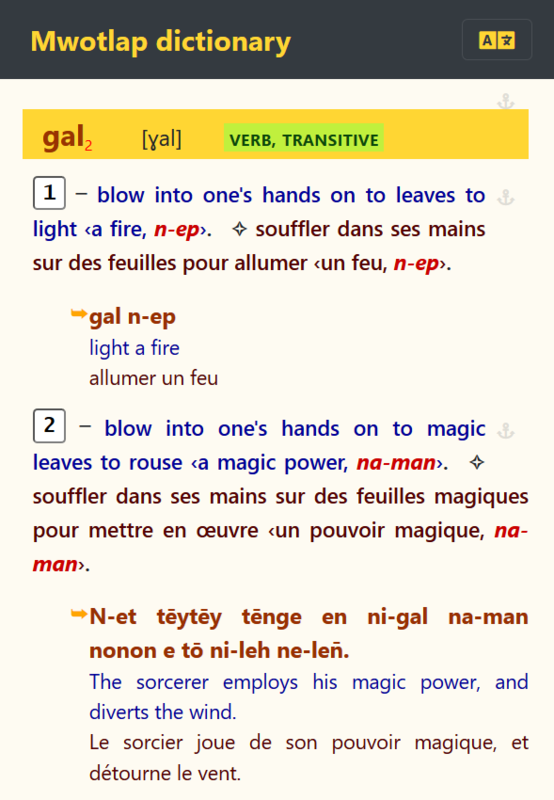 Welcome to the 2019 online version of my Mwotlap – English – French dictionary! You can download a Pdf version of the Mwotlap dictionary; or access the electronic version by clicking on the picture. 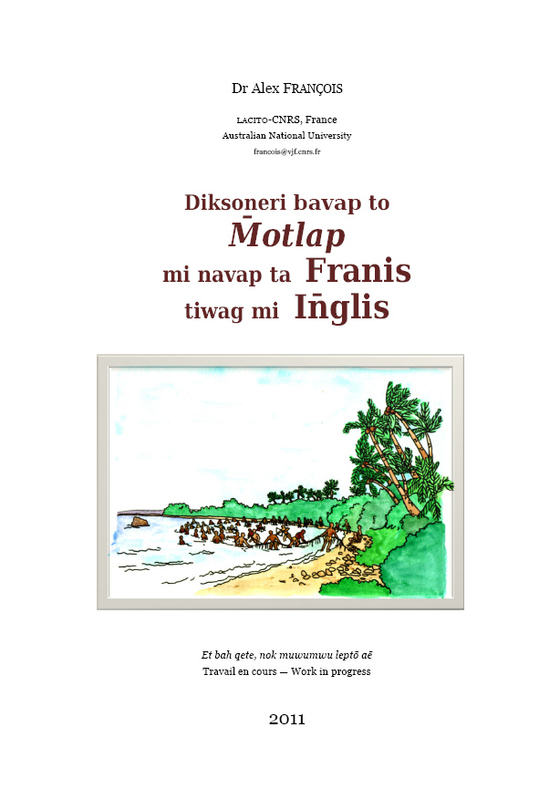 Started in 1998, this Mwotlap dictionary is still very much in progress, due to the various projects I am committed to regarding the various languages of northern Vanuatu. While some entries are already reasonably detailed (e.g. 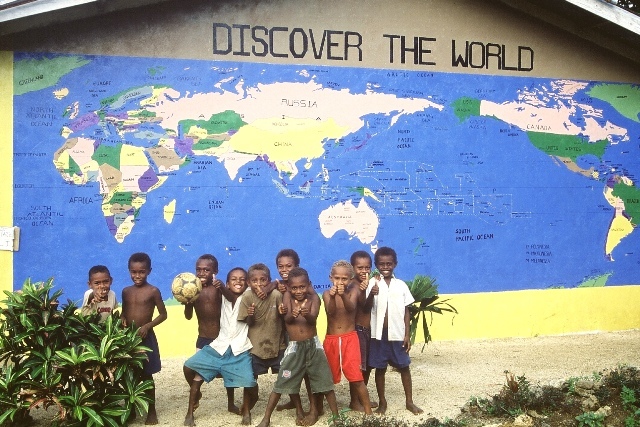 van 'go'), others still need to be developed (e.g. mi 'with'), while others are still absent altogether. With only 1710 entries at this point, this dictionary only contains a portion – perhaps half – of the vocabulary I have collected in Mwotlap. To this, one may add the task of translating French to English, which has been only partly done at this stage, and still needs to be polished. The future published version of this dictionary will contain an introduction explaining typographical conventions and other elements useful to the reader. This whole endeavour, which I have had to interrupt, belongs to my long-term projects. Feel free to contact me for any follow-up question regarding this dictionary. I am grateful to LabEx EFL for their support in 2016 and 2017; and particularly to the two IT engineers who helped me for this project: Céline Buret and Benjamin Galliot. They wrote the Python code (respectively Pylmflib and Lexika) that allowed me to convert my dictionary from the Toolbox format to an XML file. Clément Plancq (Lattice-CNRS) wrote the script for the search engine. I personally worked on all segments of the chain: Lex, Python, Xml, Xslt, Js, Css, Html. Noyobem gōh, nidiksoneri bavap to M̄otlap. No meqtēg tō lēte 1998, tō memwumwu liwo van aē gaydēn̄ a qiyig agōh. Ba nemgaysēn, veg namwumwu mino nilwo len̄ meh, ak so nidiksoneri nan et bah galsi qete. En tō nōk, navavap 1710 heleg alon; togoy hip so nok so hēn̄ēn se hōw. Ēwē so nēte tile ēte goy lok se, tō namyōs mino so nok so qisen̄ hōw nokopi vitwag gōh tō hog van hiy kimi to M̄otlap en. Loyobem gōh en, nagatgat vētēl: M̄otlap, tō Franis, tō In̄glis. Nototgal yatkelgi en, ignik Wako mayap tō. Yatkel dēmdēm alon namun ige telelam en, so nok so vasem van hiy kēy so navap to M̄otlap nivan lō qele ave. Tō yatkel dēmdēm se, namungēn to M̄otlap so gēn so vatah aē tō ēglal galsi namtehal wē so yapyap nohohole timigēn. Nok dēmtig so kimi temlaklak aē. Kimi wo nemyōs so vēhge te hap me hiy no en, ami rin̄ tog me, so nethap, kimi yap me nimel a lokobyuta. Vēwē kimi. No natam kimi del.